Contact lenses offer so much more than just clearer vision. They can help your eyes heal, control the progression of myopia, and give you the freedom to live day to day without the hassle of glasses. Proudly serving Idaho’s Butte County and Bingham County areas for more than 9 years. At Complete Family Eye Care we carry a number of trusted brands, as well as excellent custom brands. Whatever you need, we’ll help you find the right contact lens. We’re dedicated to finding contact lenses that work for you. That’s why we’ve created our Contact Lens Success Program. 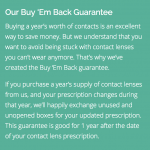 When you purchase contact lenses from us, we’ll go through all the necessary steps to make sure your lenses are exactly what you want them to be. That’s why we include up to 8 weeks of follow-up visits at no additional charge. Rigid lenses aren’t as popular as soft lenses but they offer the advantages of durability and crisp vision. Using our state-of-the-art technology, we’ll take ultra precise measurements of your eyes. Challenges such as astigmatism, presbyopia, keratoconus and dry eyes needn’t be a barrier to contact lens.